Under the guise of historical preservation, Southern states have passed laws preventing the removal of Confederate symbols. When Dylann Roof murdered nine African Americans inside a storied black church in Charleston, South Carolina, on June 2015, he hoped to incite a “race war.” He failed. 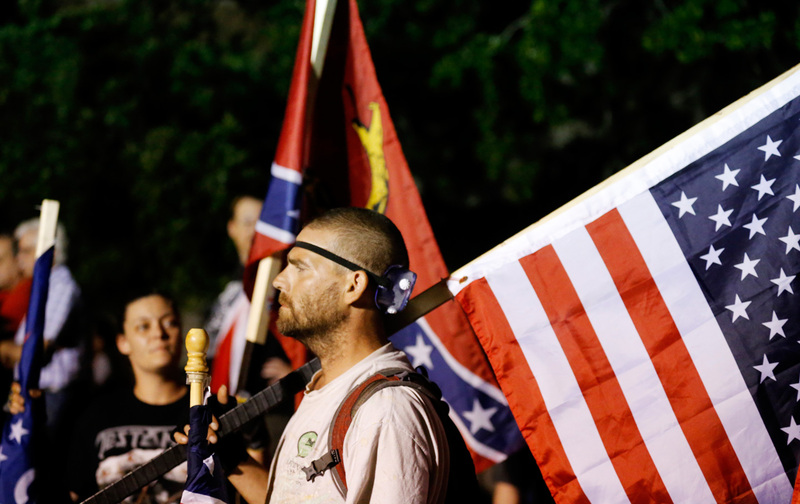 What his violence did provoke, however, was a national reassessment of Confederate symbolism. Photographs of the murderer posing with the Confederate flag galvanized the fight to remove symbols of that failed rebellion from public spaces. According to the Southern Poverty Law Center, at least 60 of the over 1,500 publicly funded Confederate symbols nationwide have been pulled down or renamed by state and local governments since the massacre. In some cases, these changes took place without complaint, but other instances provoked vehement resistance. In New Orleans, four prominent monuments were removed in April and May, but only after many delays, and then mostly under the cover of darkness by workers in bulletproof vests because of the death threats they had received. Despite these threats, other communities, such as Baltimore, have announced their intention to follow suit. As the movement to remove Confederate monuments gains steam, so too does the opposition. In addition to street demonstrations, lawsuits, and death threats, the backlash to monument removal is now taking hold in state legislatures. Republican state lawmakers across the South have proposed legislation to protect Confederate symbols. Since 2015, bills have been signed into law in Alabama, North Carolina, and Tennessee, and proposed in Louisiana, Mississippi, Missouri, and Virginia. While these laws are written broadly to protect monuments to any historical cause, it is clear that they designed to prevent blue (often black) cities and towns in deep-red states from altering symbols of the Confederacy. The Alabama law, for instance, means that Birmingham, which is nearly three-quarters African American, cannot implement the city’s 2015 decision to remove a 52-foot monument from a city park. These laws, and the broader opposition to altering Confederate monuments, are typically defended on the grounds of historical preservation. The argument centers on the claim that they are historic artifacts that had nothing to do with race or politics when they were erected and have nothing to do with race and politics today. “My intent,” said the sponsor of the Alabama bill, “is to preserve memorials to all of Alabama’s history…for generations to come.” What reasonable person could be against remembering history and preserving heritage? What is more, the defense of Confederate monuments in the name of history and heritage conceals powerful political motivations and interests in the present. Appeals to the past confer political legitimacy on an issue that make it off-limits for political decision-making. When an issue is kept off the political agenda, the status quo prevails. “The authority of the ‘eternal yesterday,’” as sociologist Max Weber called it, uses the weight of history, memory, and collective identity to sanctify actions taken in the present in pursuit of partisan interests. So, while it appears to speak for the past, the heritage defense is a strategy for political victory today. The heritage argument, however, is losing its attraction for many people, and communities are taking action against monuments they find indefensible. Legal restrictions thus complete the task that persuasion was unable to achieve: They rip the monuments out of the realm of politics. They use the force of law to preclude deliberation, debate, and compromise, thus foreclosing the possibility of democratic solutions. Historic preservation is not always a political battle. Much of our heritage deserves protection. But when the commemorated cause was unquestionably “on the wrong side of humanity,” as Landrieu put it—and as the slave-holding regime surely was—communities of the living should get a voice. Rather than listening when their citizens speak up and demand change, Southern states are silencing their cries in order to amplify the voice of an inglorious past. Jonathan S. BlakeTwitterJonathan S. Blake is a Visiting Fellow at the Global Policy Initiative at Columbia University and a politics editor at the Los Angeles Review of Books. He recently completed a book on the politics of nationalist rituals in Northern Ireland.